Acer decided to try their luck in the emerging segment of expensive smartphones where currently there is only one player – HTC Desire V. Now Acer has come with a new smartphone i.e. Acer Liquid Gallant Duo. Let’s see whether Acer beat those famous brands, smartphones, below we have mentioned the review of Acer Liquid Gallant Duo and its features. 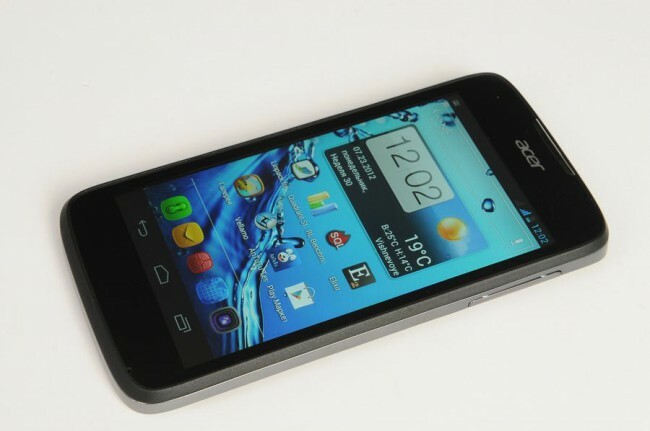 The smartphone Acer Liquid Gallant Duo is equipped with 4.3″ display with a resolution 960 x 540 pixels (brightness of 16 cd / m ² to 190 cd / m ²), is running an operating system Android 4.0.3, equipped with a processor MTK 6575 with 1 GHz CPU, GPU PowerVR SGX 531 and 1 GB of RAM. Call the exact cost is still too early, but the company insist that the price tag will not be higher than 370 USD. In addition to performance, HTC smartphones have always had a huge advantage, a proprietary interface HTC Sense 4.0, but the developers Acer Liquid Gallant Duo tried to give their offspring a unique look. It turns out that the only thing Acer concedes HTC, is the capacity of the battery, 1500 mA / h vs. 1650 mA / h But it is on paper. The design elements resonate with many smartphone devices at the same time make it distinctive. Smartphone 3000 hryvnia can be compared to Samsung Galaxy Nexus, and because of the missing and the other keys on the front panel. Both are content with virtual buttons part of the working area of the screen. The frame around the display, though not a record has a thick, but not recently considered inferior to LG Optimus 4x HD. But the big WOW-effect occurs when you look at the back of the smartphone that includes a power key / lock. It is located near the 5 megapixel camera lens. This arrangement, in addition to a unique and but there are disadvantages. You feel like a hero of the movie Indiana Jones, where the hero is often necessary to search for buttons and bars, where at first glance, they simply should not be. Whatever it was, but the designers managed to reach the goal – to give the unusual device. The front part of the body of Acer Liquid Gallant Duo is covered with tempered glass, which in turn is protected overhang on its edges. The upper part is a speaker, proximity and light, and light sensor. Below the display there was a place only for the microphone. At the bottom and left side is empty, and only on the right, almost at the very top, dual key is volume. At the top end there are two connectors – 3.5 mm and MicroUSB. In Acer Liquid Gallant Duo, the removable cover is made of a soft-touch plastic. At the bottom of the slots are a multimedia speaker. At the top, between the button on / lock and lens 5 megapixel camera there is LED flash. Power button is small, but distinct from the typical course of a click, so, no complaints to its work does not arise. As with the previous guest Acer Liquid Glow, a smartphone running the operating system Android 4.0.3, but in contrast to the Glow, it uses a proprietary shell. Lock Screen meets four shortcuts for quick access to a telephone keypad, messaging, web browser and camera. Reassign the labels or their location cannot be. Go to the menu notification when your screen is locked and will not work, it will have to unlock it. Animation unlock the screen, like the opening or closing the blinds, because of what the interface is not similar to that used in the Samsung, HTC and LG. To activate the Quick Launch shortcuts you need to select a shortcut and hold to move left or right. The desktop consists of seven boxes. Their number is not regulated. Adding shortcuts, and widgets on the desktop is on the same principle as in the pure Android, that is, only through the menu “Applications” and “Widgets”. There is a rapid creation of folders by dragging and dropping icons on each other. To change the interface should use a separate application – “Threads”. In it you will find six different options, including Google’s standard. – Polaris Office – an application for working with office suite documents, which can replace the file manager. – Media Server – access to media files via Wi-Fi-connection. Among the advanced settings, note the timer on / off and SRS Sound (three preset sound preset). The interface works with two SIM cards is typical for the devices on the platform MTK. The user selects from what the default SIM will make calls, send messages and Internet access. Otherwise, the execution of those actions, it will be necessary to specify which of the SIM card to use. There you can select modes while roaming and the type of networks, GSM / WCDMA or only WCDMA. Because Acer Liquid Gallant Duo installed a radio, with which simultaneous work two SIM cards can only be in standby mode. Because of the dampness firmware it could not determine whether the available second SIM card, if the first is Internet access. 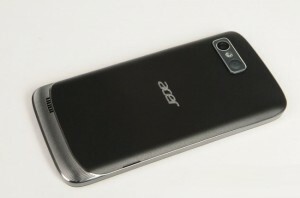 The smartphone Acer Liquid Gallant Duo uses a system-on-chip from the company MediaTek, MTK 6575. It includes a Cortex A9 GHz processor for basic tasks and PowerVR SGX graphics processor 531. RAM is 1 GB and 4 GB storage memory, of which about 2.5 GB is available. Do not expect from this high-performance processor, but with things being equal, MTK 6575 shows a higher than counterparts from Qualcomm and TI, to Moreover, this platform is not as greedy. Therefore, we can assume that the results of Acer Liquid Gallant Duo and HTC Desire V will be on the same level. Unfortunately, the figures confirm our view still does not work, because the device in question is still quite raw and does not allow to complete the test battery. I’m sure many of my readers who are either interested in how Chinese devices, which often come to the platform, MTK, know that the weak point of the system-on-chip in a weak or no signal from the GPS-receiver. In Gallant Duo problem is present. On the Internet, there are methods to solve it, so should not get upset, but the producers and the time has come to think about. To talk about the smoothness of the interface is also too early to affect the lack of optimization, but because the interface is not overloaded with animation, we can assume that the commercial sample, all will operate smoothly. The Acer Liquid Gallant Duo smartphone is equipped with a 5 megapixel camera with flash. The maximum photo resolution – 2592 x 1944 pixels, video – 1280 x 720 pixels. Interface viewfinder remained intact and complete copy of the one we saw in the Samsung Galaxy Nexus. To the left of the display will flash and the type of memory used on the right – the zoom slider, a shortcut to call settings, shutter button and the icon select the type of shooting – “The volume picture,” “Panorama,” “Video” and “Picture.” To focus can be used as the shutter button and pointing to the object at the option of on-screen (touch focus). Additional features of note mode HDR, but considering the quality of the photographs, it is unlikely that it will be greatly in demand. A pleasant surprise was the maximum resolution for video recording. At a time when most of the devices of this class of recording video in VGA-resolution, Acer boasts HD-quality. It is understood that for such a high-resolution interpolation is used, and the video quality is quite suitable for home use. The range of Acer smartphones is limited. It is understood that Acer is not in the direction of the main, however, the manufacturer tries to produce a balanced machines, which have several advantages over the competition. An example of this Liquid Gallant Duo – the most productive Android-smartphone with support for two SIM cards. In addition, it has other advantages, such as build quality and materials, Android Ice Cream Sandwich, the interface and the presence of extra time, all this makes the smart one of the best devices of this class.